It was very difficult back then because there was no help at all. So I had to learn things on my own. I searched and wrote hospitals all over the US in search of information and there just wasn't much. Most just explained the disease and that there was no treatment. At six weeks of age the Doctors said there was nothing that could be done for him�and if I wanted they would released him to my care. They said he would only live a very short time. Boy were they wrong. He was 6lbs 7oz at birth when I brought him home his weight was just over 4lbs. Dan's hands were a problem from the start because of the damage he did to himself. I had to put booties over them because he did so much damage to his face and neck. By doing this it helped the webbing process. His fingers were almost completely webbed by the age of two. It seemed the Doctors wanted to treat EB like they do burn-patients. At least they always did this for Dan. I hated the Silvidene and mummy wraps for Dan. The dressings looked good right after they were done but in a short time everything turned a gray color. The worst part that he was unable to move. With this treatment, Dan became very down and unhappy so I went back to the telfa and handi-wrap ones which he was happy in because his movements were not restricted. It cut the air out and he was not in so much pain. I know the handi-wrap bandages were not the best but I did what I had to ease his pain and suffering. Dan had a lot of bouts with eye trouble. He would go to bed alright and when he awoke in the morning his eyes would be sore. The worst lasted three days. It was always both eyes. He did out grow the problem but I can't remember at what age. Dan had stigmatism and had glasses but could not wear them because of the damage they did on his nose and to his ears. Dan never had any. Let me tell you why I was never sorry that I didn't have Dan's fingers separated. When Dan was in Ann Arbor having some teeth out there was a young girl by the name of Jane Doe who had Dystrophic Epidermolysis Bullosa also having all her teeth out. She was about 10. This was when Dan was a teenager anyway. We went to the cafeteria with Jane Doe and her mother for lunch. I observed Jane's hands while she was eating. Her fingers were slightly curved and very stiff . She was unable to make a complete fist. She had a very difficult time using her fingers to do anything. Her mother had to assist her. She could barely hold her glass. Her fingers seemed to get in the way when she went to pick up things. Even though Dan's fingers were webbed he functioned better than she because he was not always bumping things like she did. He had no trouble holding a glass although it had to be a small one. Dan could not open a door with his hands but niether could she. Dan could print, use color pencils in coloring books, draw pictures, cut with little scissors, he built with lego blocks, built with an erector set, he could start the screws, he couldn't tighten them so we helped him with that. He cooked all the time. He could cut up such things as onions or whatever. Oddly, he never got tears from onions like most people. I signed papers so they could photograph the whole operation for their medical information at Ann Arbor. They agreed not to show his face. When he did have the surgery he was never intubated. It was risky but necessary. I agree with you, they are bad applied to the skin, but I think Dan being on liquid Decadron may have saved his life when he was born. Although I can't prove it. I know when he had blood transfusions that was the only thing that helped the severe rashes he got. Dan did not tolerate shots. They were tried when he was a baby but the medication would shoot back out the needle site and he would develop a swollen spot the size of a very large egg. So after a few tries I never let them inject him again. In fact he never had any the rest of his life. Dan's blisters came in crops in intervals along with the ones caused by trauma. With Dan everything stuck that touched his sores and it didn't take long, it was as if a person glued them on. It was very difficult getting him un stuck. It was very painfull and there was blood loss which sure didn't help his anemia. I handled the problem in this manner. I would cut whatever was stuck as close to the sore as possible. I cut up a lot of things over the years. Then I would take Q-tips or the back of a spoon and coat the material that was stuck with vasolene, rub it in gently and let it soak awhile. Then I would take tweezers and lift up a edge piece and work vasolene between the material and the sore and rub gently between the two working them apart. This took along time but it worked with little blood loss and there was little pain for Dan. � I know most, especially doctors frown on vasolene and plastic wrap but I swore by it in Dan's case. This type of dressing made it possible for him to live with much less pain. In fact, Dr. Pearson is the one that introduced me to this kind of dressings. He once told me they even greased X-ray sheets and put EB babies on them. � I know of one lady who had a daughter with a milder form than Dan and she used Gelform Powder on the blister after she broke them and bandaged with telfa. She said it really worked for her daughter but I tried it on Dan and the only benefit he got was it stopped the bleeding. That is what it is perscribed for. It is a percription item. � Even telfa on Dan would stick, unless I put a thin coat of vasolene on them. I know he had a challenging form.�Probably Recessive Dystrophic Hallopeau-Simens. Dan had some non-healing sores that lasted his whole life and he never developed cancer. When Dan was first born I was told of a lady that had an eight month old baby with EB and they gave me her phone number. So I called her and when I did her baby had died. I felt just terrible and didn't know what to say. She said it was ok and she said this was her second child she had lost to EB. 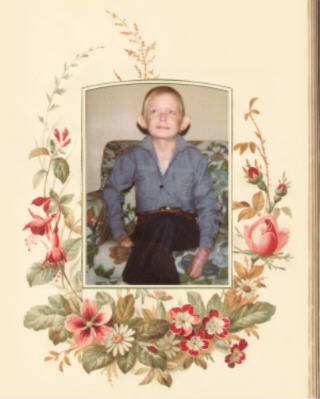 � I heard of a family here in Michigan that had a boy with the severe form of EB and he lived in the Mary Freebed Hospital in Grand Rapids, Michigan. I was making arrangements with the parents and the doctors to go and see him but he died before I got to meet him. He was only 9 years old. � Another time when Dan was in the hospital in Ann Arbor there was a new born baby there with EB. The doctors asked if I wanted to meet the parents and see the baby. Of course I said yes but again the baby died before I got to meet the parents and see the baby. I guess it was GOD'S will it wasn't meant for me to meet these parents or kids. �*What Dan liked and was able to do*. Dan's sister's took turns walking with him up town or where ever. When he had his first niece and nephew they went in a wagon he pulled behind his electric wheelchair.�Dan loved people and talking to them on his trips up-town. He went anyday it was possible. He knew all the prices in the grocery stores and loved to shop for things to cook for himself and others. He liked to go to the drug store, they had a fountain and they got cherry cokes or sundea's. We took him fishing on the lake on very calm days. He loved the boat ride. We fixed him a small pole and he could reel in the tiny fish himself, we put the bait on his hook took and took the fish off his hook, we helped him�reel in the bigger ones. He had an aquarium and loved to feed and watch the fish. His favorite was a nute which was reddish in color and looked like a lizard. He collected match box cars. He liked to run remote controlled cars. He built with Lego blocks and an erector set. He liked to build plastic models but I caught him sniffing the glue (STINKER!!) so I had to buy a different type. As webbed as his hands were he could print, color poster pictured with colored pencils. He drew pictures he could even cut with a small pair of scissors. His favorite movie was Howard The Duck and on TV was The Brady Bunch. He watched these even after he was deaf. Later, Dan had trouble breathing because of his anemia. He had to have a fan circulating the air around him at night. It helped that he wasn't active because exertion would have made his breathing even worse, I'm sure. My mother has made quilts all her life for the family and has taught myself and my sisters how to make them. We have a great time when we get together and tie them off. My mother made one for Dan almost every year for Christmas and he really looked forward to them. ~My motto~ ..."Yesterday is gone, tomorrow never comes so�all I need to do is the best I can this day." A special thanks to Renee Kontos for her scanning abilities! ...and the special photo frame!...and also to *Nab Graphics* for making the special memorial graphics for this page!